Our extensive range of school desks are made to meet the health and safety requirements of growing children, ensuring that every product on our website is designed to withstand the daily wear and tear of a busy and vibrant learning environment. We offer school classroom tables of all shapes, colours and sizes, including crushed bent tables, fully welded tables, height adjustable tables and exam desks, giving you an excellent selection of modern and cost-efficient options to choose from. Our range caters for the whole education spectrum, starting at play school and moving onwards through nursery schools, primary schools, secondary schools, colleges and universities. Choosing the right desks & tables for your school can be one of the toughest decisions that you will have to make when making budget decisions. Deciding how the desks look as well as how well they will function for the pupils that will be using them, are all deciding factors, but getting the correct size and type are the first things that should be considered. Are they the correct height for the pupils using them? Will the student be using the desks for art, maths or in the science lab? All these questions will affect the size and type of desk that will be needed. At Just for Schools, we can help alleviate the pressures of these decisions as we offer a free design service which will consider all factors and ensure that your school gets the right product, for the right purpose, at the right price. With schools’ fillings up and class sizes growing ever larger, adjustable desks which cater to a wide range of age groups are the solution. Ideal for primary schools and high schools where pupils’ heights and ages differ considerably, they help create a multifunctional environment to assist participation and learning. We offer single desks which vary in height, perfect for exams or silent study. We also offer larger trapezoid and semi-circular desks, easily maneuverable, creating efficient workspaces. They are available in a variety of colours, helping to build a happy relaxing classroom aesthetic. With optional under desk storage and cantilever legs, Just For Schools’ adjustable desks are a high quality furniture solution benefiting student productivity and wellbeing. 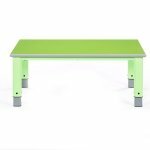 Replicate the vibrancy of the classroom through your choice of furniture by selecting from our assortment of colourful and shaped tables for the younger pupils. Inspire creativity whilst providing a sturdy platform for learning, our excellent tables are manufactured in the UK and easy to assemble. Quick-clean laminate tops, our tables are perfect for nursery and up because of their adjustable leg height. Helping to create a safe, environmentally friendly setting for little ones and laying the foundation for imaginative learning, browse Just For Schools’ inventive table collection and design the best classroom possible. Our fully welded school classroom desks and crushed bent classroom desks are available in a variety of sizes shapes and colours, providing a robust reliable furniture solution. With either MDF MBS or PU edging, the desks are safe and quick to clean. Make space an option with the popular stackable variants, giving classrooms the flexibility to keep up with the teacher’s needs. Assisting teachers with high quality platforms for success, our tables can be quickly maneuvered to create the ideal learning environment. A staple of every modern classroom, the multifunctional computer trolley allows school technology to be accessible and transported safely. Ideal for printers, files, folders, monitors and keyboards, the portable shelf space provides plenty of room for individual work alongside class supervision. Quickly connect up to the smart screen or move around the classroom for easy printer access; the trolley will become an essential addition for your school. Give your workspace purpose with specially designed furniture. High tables are perfect for science classes and laboratory work where students are required to work practically and move around safely. They are a compact alternative available in a range of sizes, providing plenty of seat placements where space can be limited. Additionally we offer activity tables, perfect for schools, nurseries and the home. These well designed tables are foldable, lightweight and robust, ideal for playtime and lunchtime. We offer a range of designs and sizes, excellent for a variety of uses. 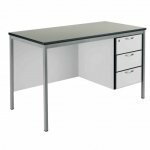 Specifically designed for teachers within a teaching environment, Just For Schools offers high quality sturdy desks in a range of sizes. 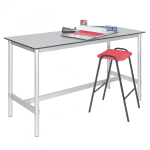 Part-furniture part-assistant, these value for money desks hold a five year guarantee and will permanently secure away important documents and devices. Just For School wants to assist the classroom as much as possible, and giving teachers the foundation to succeed is our top priority. Available in a range of colours and finishes, the desks are cleanable and made from extra-durable materials.